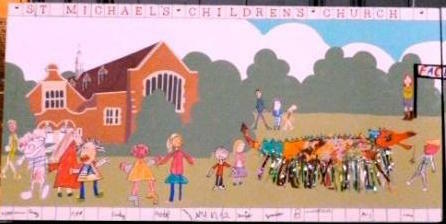 At St Michael’s we are keen to assist local schools in any way we can. - promoted children’s film making, art and photography at the Bedford Park Festival and creative writing in the annual poetry competition at the Chiswick Book Festival and other children's events. 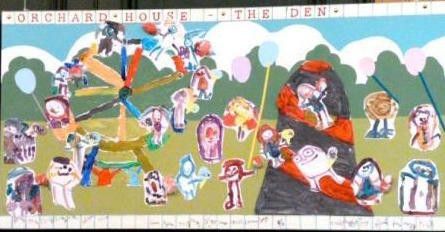 We regularly host local schools in the church and welcome visits from school parties of all ages. The church building is a fantastic resource: we are happy to offer tours of the church and the clergy are glad to give school talks on a wide range of subjects. There is much in and around the church to draw and write about. Recent primary school visits have focused on subjects from the importance of churches for Christians to the history of dragons (we have quite a few at SMAAA!). For older pupils, we can help you offer a theological or church-historical perspective on GCSE and A-Level texts and topics in numerous humanities and other disciplines. Our World War I Remembrance Project is supported by the Heritage Lottery Fund and we are again offering it to schools (as we did with the exhibition on 'Chiswick, the Blitz and the First V2', which was commissioned and displayed by the Chiswick Book Festival in 2015). We have researched the stories of 128 members of the parish who lost their lives in WW1 and who are commemorated on our War Memorial plaque and the memorial seat outside St Michael & All Angels Parish Hall. Supported by a grant from the Heritage Lottery Foundation, exhibitions about their stories are shown regularly in the church. The first was displayed over the Remembrance season in November 2014: The First Who Fell. In 2015, we honoured the memory of the 15 men who died in 1915 by telling their stories on 14 Remembrance panels in the church and in 2016, we remembered the Battle of The Somme. In 2017 the Exhibition marked the lives of ten of the 37 servicemen who died in 1917 and you can read about the others - and those who died in earlier years - on our new WW1 Project website. There is a section devoted to Learning. The clergy at St Michael’s enjoy leading and assisting with assemblies in schools. And local schools often choose to celebrate or commemorate special occasions in the church. Harvest, Remembrance, Advent & Christmas (picture) and Easter (links for all these) are all popular times for school orientated visits and services. We can offer special visits focused on key moments within the church calendar and included in the National Curriculum syllabus. The history of the World Wars (Remembrance), Ritual meals (Passover & Easter), Waiting (Advent) & Journeying (Pilgrimage). Whether you are an early years, primary or secondary school, we can advise you about how to use St Michael’s to enrich your existing syllabus. Please contact the parish manager Anna Benson to discuss your individual needs (c/o parishoffice@smaaa.org.uk). We should love to hear any other ideas you would like to suggest to us. We enjoy hearing from local schools, meeting the children and teachers and supporting new plans and projects.